Afghan measures approximately 34" x 42"
To save time, take time to check gauge! 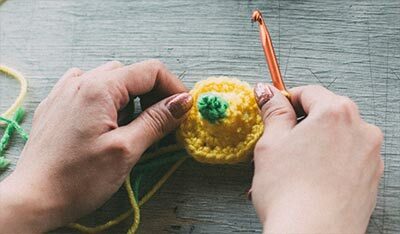 rep=repeat Note: There's a handy guide to commonly used crochet and knitting abbreviations in FAQ. To Begin: With Main color, loosely ch 107 sts. Row 1: Work 1 sc in 2nd ch from hook and in each ch across. Ch 1 and turn at end of this and each row (106 sts). Row 2 and all rows: Work 1 sc in each st across. 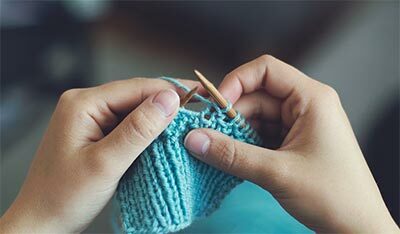 Work until 146 rows have been completed. Row 1: Join Powder Blue in any corner. Work this corner and all corners as follows in parenthesis ( 1 sc, ch 3, 1 sc) all in corner st, ch 1 skip 1 st. If working across narrow edge, work * 1 sc, ch 1, skip 1 st, rep from * across to corner, work corner. Across long edge work 1 sc, ch1, skip 1 row, rep from * across, work corner, continue around. Fasten off Powder Blue. Row 2: With Peach, join yarn in ch-3 corner. Work 1 sc, ch 3, 1 sc all in corner. Ch 1, * work 1 sc, in ch-1 in spaces of row below, ch 1, rep from * to corner, work corner in corner, continue around. Fasten off Peach. Row 3: With Lilac rep row 2. Row 4: With Pink rep row 2. Row 5: With Mint rep row 2. Row 6: With yellow, join yarn with sc in any ch-3 corner, work picot (ch 3, sc in first st of ch 3), 1 sc in corner, ch 1, 1 sc in ch-1 in spaces of row below, picot, ch 1, * 1 sc, ch 1, in each of next 3 ch-1 in spaces, picot, in same stitch as last sc, ch 1, rep from * across, work around with a picot in each ch-3 corner. Fasten off. Follow chart, work one cross st (worked over 1 row) for window box using Blue. Position animals according to chart and work in colors as indicated. Work all stitches in a loose and even tension and all top cross stitches in same direction. Note: This is the larget size graphic we have for the animal chart.